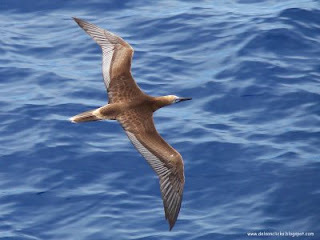 True Wild Life | Booby | The booby is a large species of sea-bird closely related to the gannet. Boobies spend their lives at sea hunting fish and are found on the east coast of Central and South America, and across the tropical islands of the South Pacific as far west as the Galapagos islands. The booby is the most commonly found sea-bird on the Galapagos islands. There are six different species of booby found nesting on the tropical and subtropical islands and continental coasts across the south eastern Pacific Ocean, although fossil evidence suggests that there were numerous species of booby that are now extinct and are believed to inhabited regions as far east as Europe. 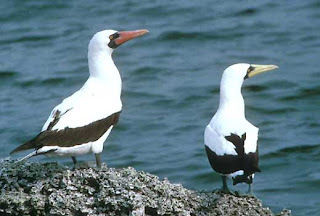 The different species of booby are all very similar in size and appearance but each species of booby appears to have it's own uniquely distinguishable features. 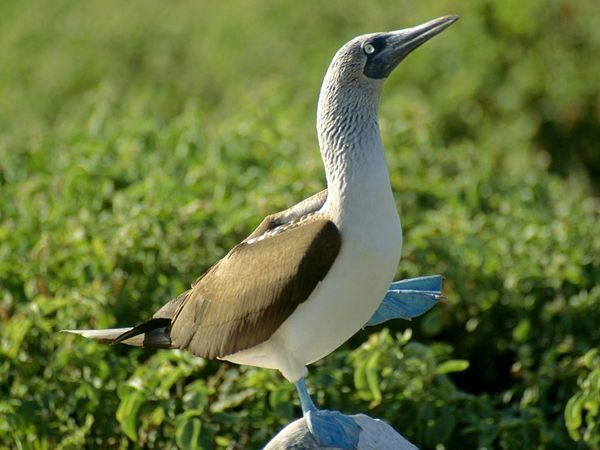 The different species of booby are the blue-footed booby, the red-footed booby, the brown booby, the Peruvian booby, the masked booby and the Nazca booby. 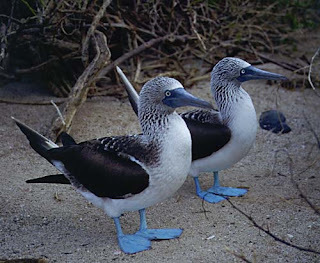 The blue-footed booby is the most well known species of booby and is most commonly found on the Galapagos islands and Ecuador. 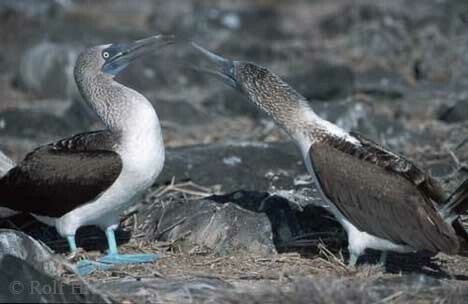 The blue-footed booby is the second largest of the booby species and is identifiable by it's bright blue feet. The female blue-footed booby is generally slightly larger than the male blue-footed booby and the female blue-footed booby also has more brightly coloured feet than the male blue-footed booby, as the male's feet are paler. The young blue-footed booby also has pale coloured feet which (in females particularly) becomes brighter as the booby gets older. The red-footed booby is slightly smaller than the blue-footed booby but the red-footed booby is known to have a wider range from the Galapagos islands to the Caribbean. As the name suggests, the re-footed booby has bright, red feet that are a pinkish colour when the red-footed booby is young. Although the re-footed booby is known to be an agile flyer, the red-footed booby can be clumsy when taking off and landing. The red-footed booby can dive through the sky to the surface of the water to catch fish at speeds of up to 60 mph. The brown booby is around half the size of the blue-footed booby and is found in the Caribbean Sea and in the Gulf Of Mexico. The brown booby has a black head and back and a white belly, short wings and a long tail. The brown booby breeds in a large colony on coastal islands and is known to spend the winter at sea, covering a larger area. As with other species of booby, the brown booby is incredible at diving. The Peruvian booby is native to Peru and parts of Chilli and is not as elaborate in appearance of the other booby species. 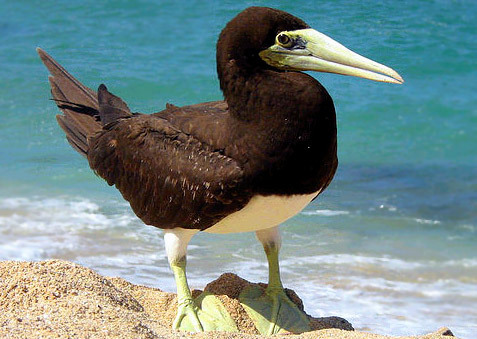 The Peruvian booby is the second most common sea-bird found in Peru and is also the second biggest sea-bird that produces guano in the country. Guano is the excrement which is produces by sea-birds, bats and seals, which has high levels of phosphorus and nitrogen and so is used to make fertilizer and gunpowder. The masked booby is distinguishable by the black colour around it's eyes. The masked booby has an enormous range that stretches from the Caribbean islands right across to Australia. The masked booby is the largest species of booby in the world and can grow to nearly a metre in height. The masked booby primarily feeds on flying fish and squid. The Nazca booby is found on islands in the eastern Pacific Ocean and is one of the most favourable birds on the Galapagos islands for eco-tourists to spot. The Nazca booby has a more rounded head than the other species of booby and is believed to be most closely related to the masked booby. The Nazca booby has a white body and a beak that is yellow or orange in colour. The booby is rarely found in regions where it cannot nest apart from those species of booby that purposefully spend the winter at sea (like the brown booby). Typically, the booby will have the same mating partner for a few years and the booby has been known to lay it's eggs all year round, although this is quite dependent on the area which the booby inhabits. The booby lays between 1 and 3 eggs (usually 2), and the booby chicks hatch after an incubation period of 4 to 5 weeks. Due to it's large size and the areas in which it inhabits. the booby has few natural predators. The main predators of the booby are owls and large birds of prey that steal the booby chicks, but the adult booby is far to big for another bird to eat. The human is the main predator of the enormous adult booby, and occasionally the odd shark. Nice blog! I''m looking for a photo of a booby to use on my blog. Could you please provide a photo credit or a link back for those great photos? Thanks.